Christianity in Japan is all but wiped out. 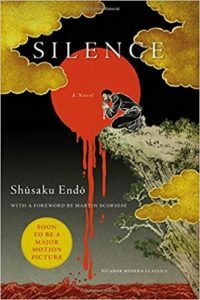 Two young Portuguese priests venture to Japan to find their teacher, only to be met by Christians who hide their religion. If they are discovered and do not denounce their faith, they are killed. As they go from one village to another in search of their teacher, it is only a matter of time before the lords of the land find them and force them to sacrifice their own beliefs or die. This story was made into a film by Martin Scorsese, which received a 2017 Oscar nomination. This is a very powerful story of what men of God will do in order to protect their flock, when they themselves question whether God is real and if he is listening to their cries for help.